Following on the success of my first cooking class at the Boghill Ctr. I am offering a pre holiday course. From November 16 to Dec. 7th. 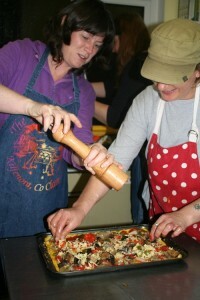 , learn how to cook delicious vegetarian meals, appetizers, ethnic dishes and desserts in a warm, friendly environment. We will use organic veg. and herbs and an assortment of whole grains, pulses and legumes. Gluten and dairy free and vegan diets are welcome! Some of the dishes these students learned how to cook were Thai pumpkin soup, quinoa croquettes with mushroom sauce, jamaican pea paddies, walnut bechamel balls and a whole lot more! This next course is 4 weeks, 2 hours a night, all supplies provided for 100 euros. email me at mary_sheehan@comcast.net. Cheers! Spuds, turnips, parsnips and carrots are what comes to mind when you think of vegetables grown and consumed in Ireland. I love the traditional vegetables, especially the variety of potatoes here but I want more options in my diet. Small farmers around Clare are experimenting with a variety of plants which you will find at the local farmers markets. One farmer in West Clare who sells her produce at the Milltown Malbay Farmers market on fridays at 4 and at a roadside stand in front of her cottage in Creegh has beautiful gardens full of colorful edibles. To see what’s in season, friend her business page on facebook – Biddy O’Dea. Fabulous Beefsteak Tomatoes shared a row with roma and the sweetest little yellow tomatoes in her polytunnel. But, ouside were radiccio lettuce, red cabbage, corn and amaranth, an ancient grain from Mexico with leaves that are used as spinach and seeds that are highly nutritious. One plant produces 40,000 seeds! And, all this outside in the Irish weather! Gotta go make a salad! Radiccio and tomato with just a drizzle of extra virgin olive oil and fresh squeezed lemon, a little Irish sea salt and cracked black pepper sprinkled with toasted amaranth seeds. Fresh, organic, clean and simple, heaven! It’s the time of the season for courgettes (or zucchini) as some of us call them. In all shapes and sizes, they are everywhere! Stuff them, steam them, stir fry them, and bake them in a cake or bread. This sweet option for courgettes is just catching on here in ireland and I pulled out my zucchini bread recipe and made it into a cake topped with cream cheese icing from Coming Home To Cook. This is a good option for those courgettes that grow a little too big. The texture is like carrot cake and the ingredients are similar. It’s dairy free and can easily be converted to gluten free by using a gf white bread flour. Enjoy! Grease and flour a 9″ cake pan or springform pan. Heat oven to 350f or 180c. Beat together 3 large eggs, 1 1/2 cups vegetable oil, 1 1/2 cups white sugar, 1 tsp. vanilla extract. Fold in 2 cups of grated, raw courgettes. Sift together 2 1/2 cups of white flour, 2 tsp. baking (bread) soda, 1 tsp. baking powder, 1/2 tsp. salt, 1 1/2 tsp. ground cinnamon. Pour batter into the cake pan and bake for 1 hour or until a toothpick comes out clean. Icing In a food processor add 8 oz. of soft cream cheese to 2 Tbl. soft butter and blend until smooth. Add 1/2 tsp. vanilla axtract and 1 lb. of powdered sugar. Ice cake when it is cool.